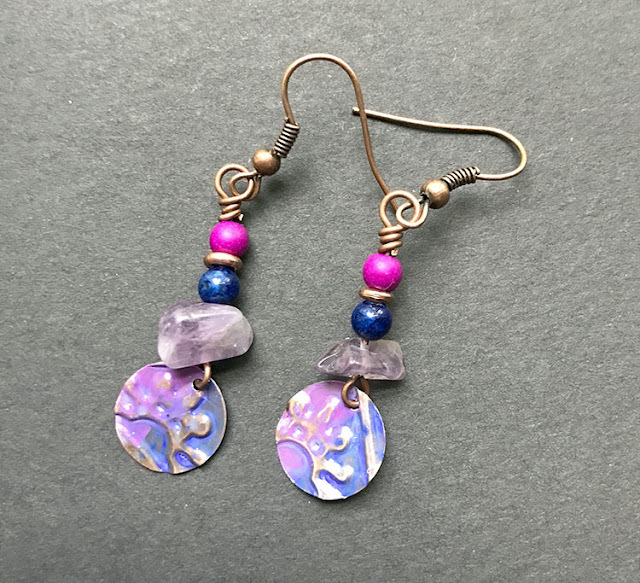 Somehow I completely missed the post about the Earrings Everyday Use Your Leftovers Challenge until I started seeing the reveals. BUT, since they left the reveal open for a few days, it wasn't too late for me to get to earring-making. 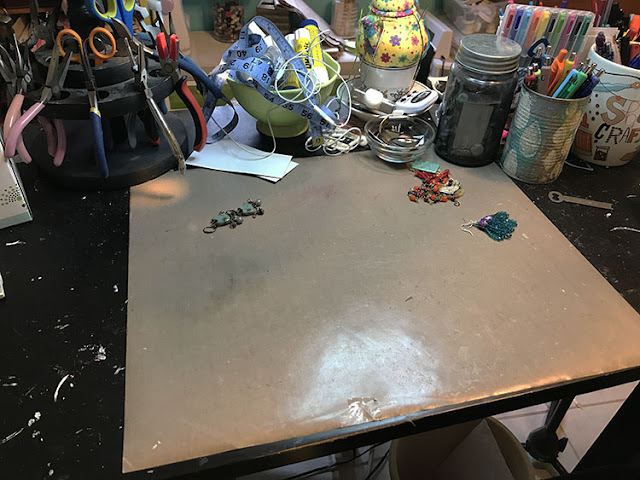 I was to start the process by taking a picture of the craftermath of a bead feast. 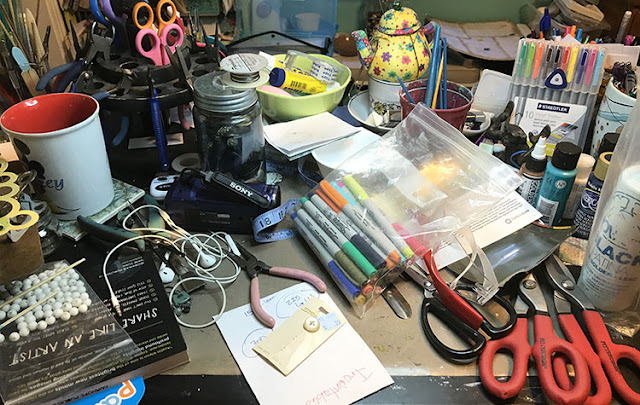 Alas, I had just cleaned my desk (for the first time in several weeks.) It was a serious shame I hadn't seen the challenge earlier. I do promise that my desk hardly ever looks like this. In fact, I did have another picture on my camera roll to prove it. But, the clean desk also meant that there were no leftovers there to pick through. Fortunately, I had plenty of leftovers stashed away from The 100 Day Project. 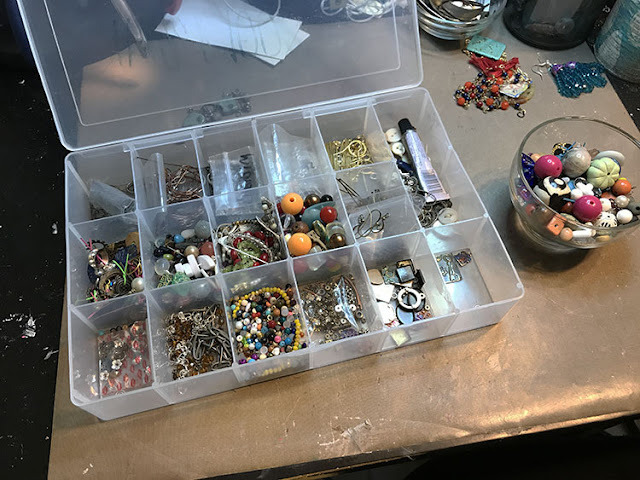 I also keep a small bowl nearby to toss in extra (leftover) beads. So, I had plenty from which to choose. From there, I set out (as instructed) to sort some of the selection into a divided box. I did this as quick as I could until I got frustrated with the process. After that, I set a timer for an hour and went to work. 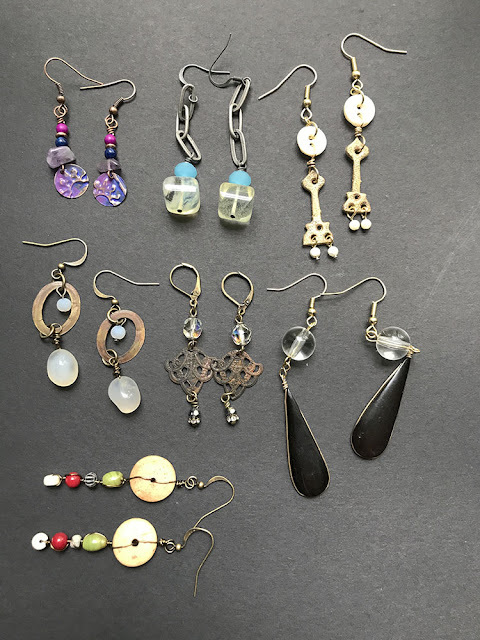 At the end of the hour, I had these seven pairs of earrings. These (above) began with the amethyst chips that were actual leftovers just sitting in the "empty" divided box. 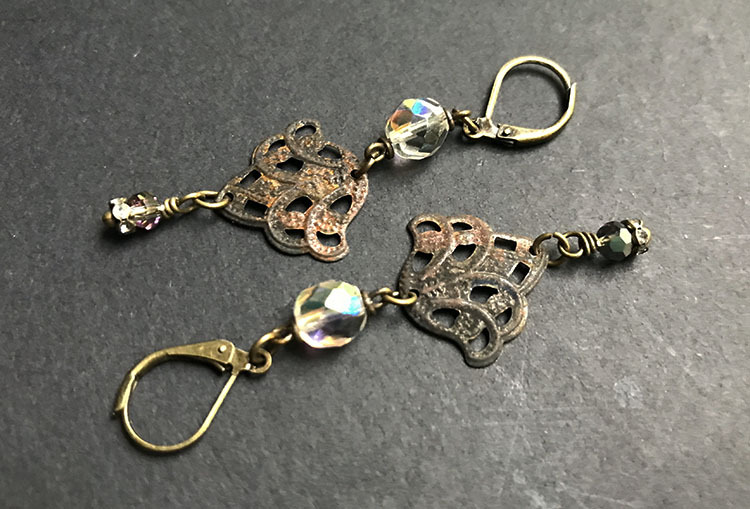 The altered copper charms called out to them before I dug out some coordinating beads from the leftover box. All these elements were in my 100 Day box. 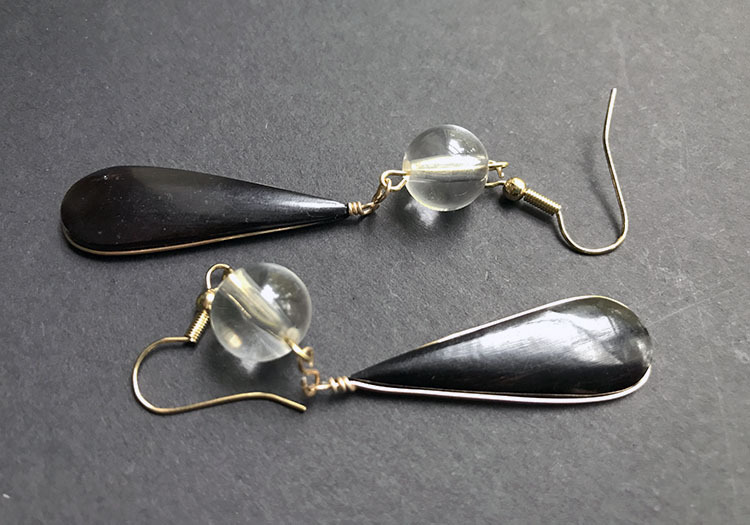 The large pineapple quartz beads were just sitting there, begging to be used. 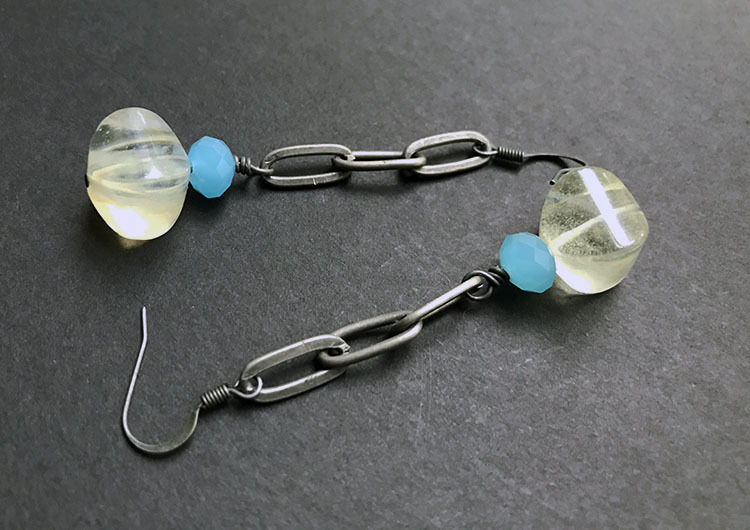 I paired them with light blue crystals and some antiqued silver chain. The faux hinges are Tim Holtz grungeboard pieces that I altered with crackle medium and gold paint. For some reason, the mother of pearl buttons and beads just seemed to go with them. It's a shame mother of pearl is so hard to photograph! All of the elements for these just seemed to fall together quickly. 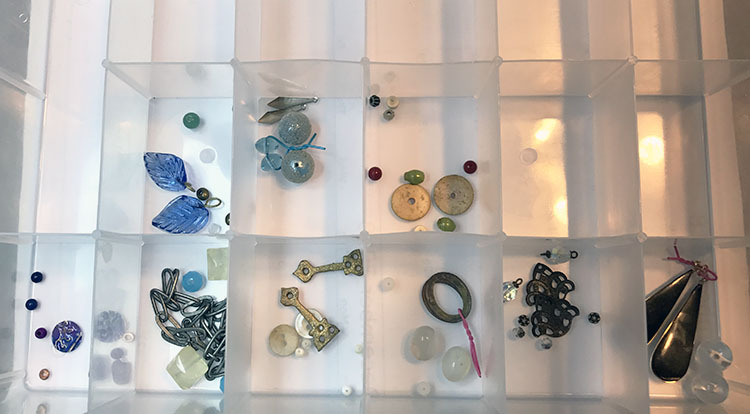 The brass folder rings always catch my eye while the moonstone-colored cultured sea glass and large milky glass beads just seemed to float to the top of the pile. I always have a favorite, and in this bunch, these are them. 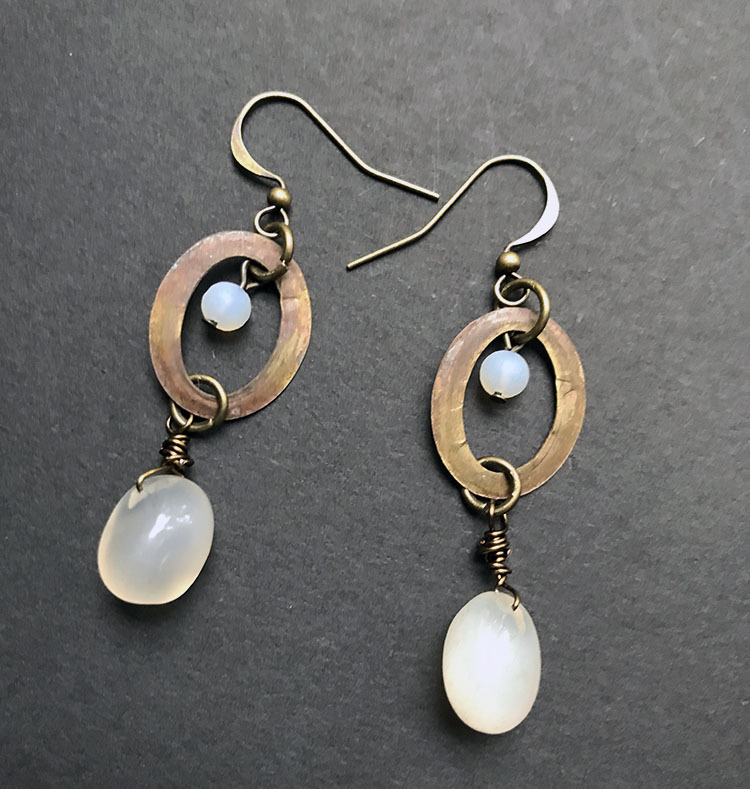 The rusty, worn filigree pieces came from a destash from Shipwreck Dandy. I can't believe I hadn't used them yet. The crystals at the top of the earrings were salvaged from an old rosary while the small crystals and rhinestone spacers were new, but went with the romantic theme of these. I wanted to get these large (already wrapped) teardrops out of the box so basic clear acrylic beads were added to accent them. I'm not positive that I'm happy with these. They don't seem to have enough personality. We'll see. Finally, the wood discs caught my eye and needed to become something fairly tribal. In all the Christmas craze, I had to bring the green and red together. I like the color combination at any time of the year, and it totally worked in this design. The timer went off before I finished the second of that last pair. I'm overly pleased with the results of this challenge, even if I had to fudge a little to get it done! 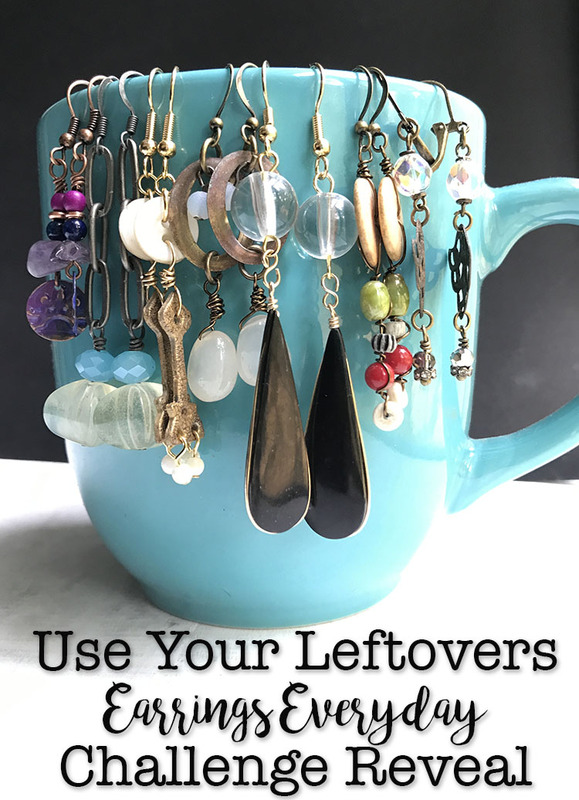 Head over the Earring Everyday to check out the other Use Your Leftovers Earrings! And, there's possibly still time for you to play along as well! It's a giveaway chance if you do. Seven days left to enter! You've got plenty of time!! I've also linked this up at Show and Share at Coastal Charm. Nice work, Hope! You were an earring making machine... I'm impressed! My favorites are the ones with the filigree pieces... I'm feeling a little Downton Abbey with those. I kind of like the simplicity of the pair with the wrapped teardrops for what it's worth. Happy holidays!! Oh wow, what a great selection of earrings. And 7 pairs in an hour, now I hope I will be able to do that one day. I think the hardest thing about making jewelry sometimes is just the designing and gathering portion of it. Since I took care of that beforehand, it was just a matter of the actual making. Once you get the basic skills down, you'll be whipping out jewelry in no time. It really is the design process that slows you down. Wishing you all the best! 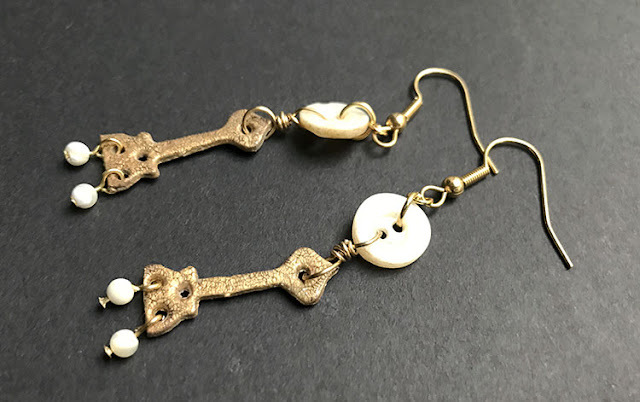 You always come up with the cutest earrings... I love em..
My favorite is your favorite-- the ones with the rusty, worn filigree pieces that came from a destash from Shipwreck Dandy. I think they are stunning. Seven pairs in an hour is impressive! Enjoy the holidays! Kathy, Aren't those fab!? It's so crazy how certain elements just come together. Seven pairs does seem like quite a bit, but I think I took lots of time pulling the beads together so the plan was already in place. I just had to actually connect everything to one another. The Pinapple Quartz ones are FANTASTIC!!! And the ones that are your favorites are drip of old comfortable romance ~ I love those!!! And the ones void of personality might surprise you ~ they are simple and straight forward and just lovely. Great job as always! Your designs are amazing! 7 pair in an hour...WOW!!! With each blog I visit I realize I missed so many designs lying right in front of me on the table :) This is a great bunch, Hope! The faux hinges are my favorite! oh WOW!!! I need to try this during my vacation! (Along with the other 99 projects from my list I'd like to accomplish!) 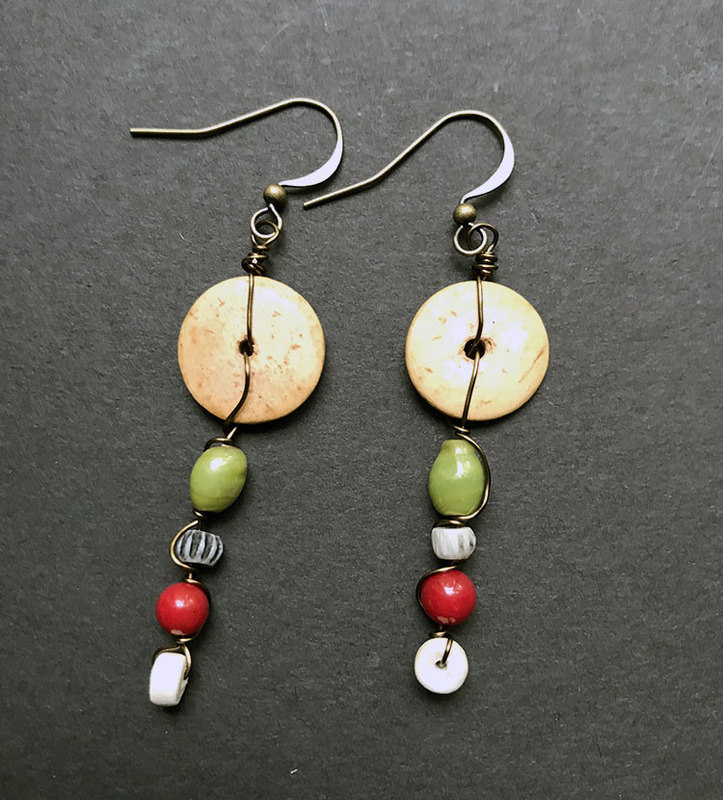 As usual, your work is gorgeous, and you have such a great eye for composing your jewelry/art! I'm with everyone else, I love those filigrees, and love the idea that the crystals came from a rosary. I'm also enamored with the glowy moonstones and the brass rings... Cool wire wrapping on the beads with the wood disks! If your desk is a mess, I think this is the perfect way to use some of the random bits left on it. (keeps you from having to put it all away too!) I'm so pleased you like the pieces I made. It was a lot if fun to do something other than Christmas shop! I forgot to say how cute to hang your creations on a coffee cup! I'll hang earrings on just about anything. Actually, as I made these, I was hanging them on the side of a tin can that I use as a pen-holder. Ha! Love the wood discs and, of course, the filigree. But, the grungeboard is the most intriguing. Happy New Year! Thanks Terry! I had a lot of fun with all of them. I do need to pull out and alter some more grungeboard though, now that you mention it! Ha! Thanks for taking a peek.